Pineapple tart or tat nenas is the best sweet pastry from Malaysia. Pineapple tart (tat nenas) has to be the most popular sweet pastry in Malaysia during the festive seasons. For the Chinese, it is a must during the Chinese New Year festival as pineapple signifies prosperity because of its shape and color. Hari Raya also can never do without tat nenas. When you pass through family houses across the street, you can smell the pineapple jam being prepared. It is such a homely aroma, beckoning you to enter. To make the jam, you can either use canned pineapples or fresh ones. Of course fresh pineapples will make better tasting jam. The tarts can be made in many shapes but the old favorite in my household is the open tart. Tip: All utensils must be cold when you are making the pastry. 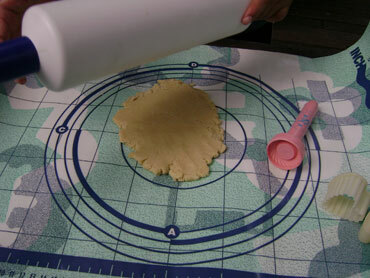 Rolling pin, rolling sheets and the tart molds. Keep these in the fridge prior to using. 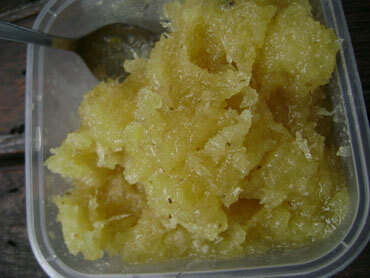 2 medium sized grated pineapple (I simply use the food processor). Peel pineapples carefully, as the skin has sharp thorns. Remove all green colored skin and the thorns (hidung) off the flesh of pineapples. Interestingly, the sharp thorns in pineapple are called hidung in Malay, meaning nose (they remind you of looking into someone's nostrils, don't you think? Grate or process finely the pineapples, drain the liquid using a sieve. The liquid or the juice can be added with a little sugar and ice cubes for a refreshing pineapple drink. Mix the pulp with a little bit of salt, sugar and the cinnamon stick in a saucepan. Simmer slowly until thicken, stir frequently to avoid burning. Jam is ready when the mixture is bubbling in the saucepan. We do not want jam which is too thick because it will be difficult to place thick jam on the tart later. 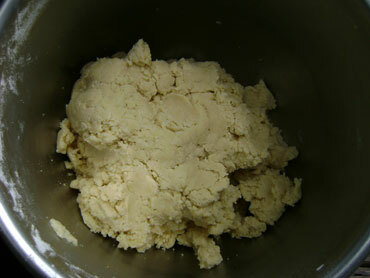 The dough; rolled out dough; coating the cutter with a bit of flour. 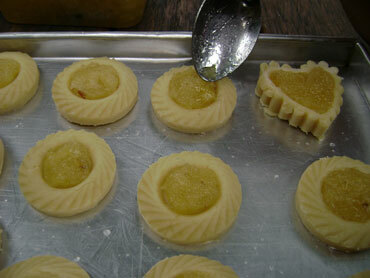 Heart shaped tart cutter; the round shaped cutter; placing jam on top of the pastry. Sieve flour, salt and sugar into a mixing bowl. Rub in margarine or butter and add cold egg yolks and vanilla essence to form a dough. Add 2 to 3 tablespoon of cold water to bind the pastry to a ball. Keep the pastry to sit for about half an hour in the fridge. 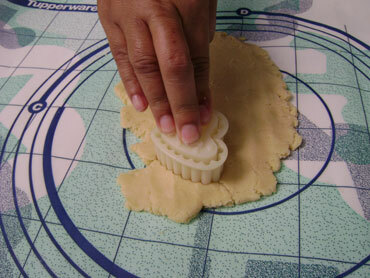 Roll pastry into 0.5cm thickness and stamp out with a pineapple tart cutter. 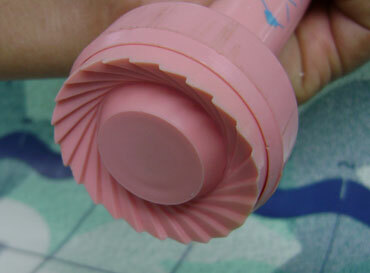 Press the middle part of the cutter deeper in the centre. Add one teaspoon of jam. 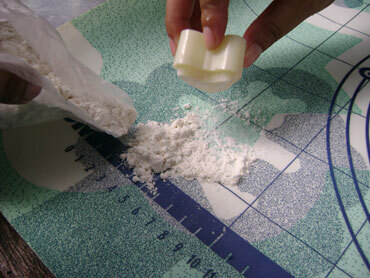 To avoid the dough from sticking to the mat or cutter, use a little flour to coat the cutter. the rolling pin and the rolling sheet. However, not too much because it will offset the dough flour-fat composition that your pastry would become tough instead of crumbly and melt in the mouth. 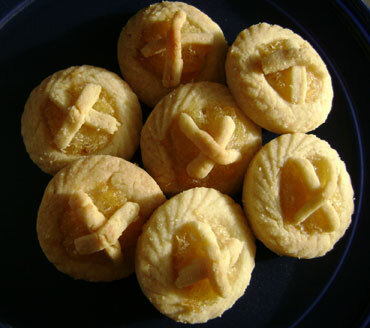 Decorate the tart with two strips of pastry placed to make a cross on the top. You may brush the surface of the tart with egg yolk if you wish.